Obsessive Compulsive Disorder (OCD) affects millions of people in the U.S. and around the world. If one of those people is someone you love, you know that the impact of OCD reaches far beyond the person who has been diagnosed with this disorder. Much has been written about OCD and its treatment. Much less has been written about the spouses, families, and friends who must watch a loved one suffer, and who must also live with the effects of the disorder every day. In an article on families of OCD sufferers, Heidi and Alec Pollard, two experts in the field of OCD, state: “OCD is a family affair. The toxic tentacles of this disorder extend far beyond its identified victim.” This section of our website is a guide for you. It was written to help you help your loved one gain control over OCD, restore relationships that have been strained by the demands and heartbreak of this disorder and help you get the help you most likely need. Life with a person who has OCD is filled with conflicting emotions. If you feel frustrated, angry, overwhelmed or hopeless, you are not alone. Today, there are new and more effective coping strategies for dealing with OCD-related difficulties. Families and friends can now take advantage of various “tools” that are effective in improving interactions between you and the OCD sufferer, and, at the same time, can help him or her succeed in the treatment process. Very importantly, when you interact with and/or provide care to an individual with OCD, you must take care of your own physical and emotional well-being. Help your loved one find appropriate treatment for OCD and encourage him or her to actively participate in the therapy process. Effective treatment is the most important step in gaining relief. Stop enabling OCD in your household or in your relationship. Participating in rituals with your loved one or accommodating avoidance behavior actually does not help. In fact, the effect can be just the opposite. Try to establish a positive emotional climate in the home. How you communicate with your loved one as well as the level of support you provide cannot be overemphasized. Before an airplane ever leaves the ground, flight attendants provide important instructions about what to do in an emergency. One of those instructions is particularly noteworthy: Put on your own oxygen mask before trying to help anyone else. The basic message is that unless you first take care of yourself, you won’t be able to help others. Yet this fundamental idea is frequently ignored by family members of individuals with OCD. And even though research has indicated that family members report some – if not severe – distress adjusting to OCD, they seldom seek the professional help they need. Instead, they usually focus on the individual with OCD. In their article on family members of OCD sufferers, Heidi and Alec Pollard list six family help-seeking myths and the fallacies behind them. 1. Myth: The only way for my life to improve is if the person with OCD gets better. Fallacy: Although life will almost certainly be better for family members if the person with OCD gets better, there are no guarantees that he or she will. You need to do whatever you can to improve the quality of your own life, even if the OCD sufferer does not recover. 2. Myth: It’s selfish to try to help myself. Fallacy: This myth implies that it’s inconsiderate to be concerned about your own well-being and that helping yourself is somehow harmful to other people. In reality, when you take care of yourself, you are in a much better position to help others. 3. Myth: Getting help for me will jeopardize my efforts to help the person with OCD. Fallacy: When you’re less overwhelmed by frustration, guilt, and other negative emotions, you are in a better state of mind and will actually be more effective in helping your loved one. 4. Myth: The person with OCD will get upset if I get help. (a) You can control whether or not the person with OCD gets upset (you can’t). (b) The person with OCD won’t get upset if you don’t get help (but he or she may get upset even if you don’t get help; you can’t control this). 5. Myth: I shouldn’t have to be the one to change. Fallacy: This myth is based on the laws of a world in which things are always fair. In the real world, you must make real decisions – even if they don’t seem fair. 6. Myth: I should be able to cope without help. Fallacy: Once again, this myth is based on a make-believe world in which you are all-knowing and never need help. In the real world, reasonable people seek help from others who have expertise or resources they don’t have. In fact, knowing when to seek help is a strength, not a weakness. The bottom line: Interacting with, and in some cases, caring for, a family member with OCD can be very stressful. To effectively help that person, you need to do whatever is necessary to take care of your own physical and emotional well-being. That may mean talking with your loved one’s cognitive behavior therapist for guidance or seeking help on your own. You may also want to consider attending a local OCD support group that is open to family members. Talking with others who have had similar experiences and learning about how they have approached family difficulties can be extremely helpful, if not therapeutic. 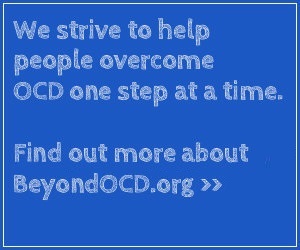 You can help bring information and education to people who have OCD and to the people who can make a difference in the quality of their lives — including family and friends, educators, clergy and the media.